The whole purpose of the keto diet is to follow a high-fat and low-carb diet. In this case, you want to try to limit your carb consumption as much as possible so that your body is able to effectively enter and stay in a state of ketosis . Ideally, you want your carb consumption to be only about 5 to 10 percent of every meal or snack. 20 to 25 percent of each meal or snack should be protein and 70 to 80 percent should be fat. If you eat too many carbs or too much protein, your body will quickly come out of ketosis. Be very careful not to go in and out of ketosis too rapidly because this can bring about feelings of confusion, dizzy spells, exhaustion and mood swings. Rice contains a whopping 45 grams of carbs per cup of white rice. While many think that brown rice is healthier, it still contains the same amount of carbs per cup serving. A better and lower-carb option to rice would be cauliflower rice, which is shaved cauliflower that you can steam. White bread contains 15 grams of carbs and wheat bread, which is often toted to be healthier, contains 12 grams per slice. Even sprouted grain breads contain as many as 15 grams per slice. Most people who consume bread eat at least two slices, so you’re talking at least 25 grams of carbs just for two pieces of bread. While you might assume that green beans, black beans and kidney beans are a healthy option for your keto diet, they are incredibly high in starch, which converts to carbs when consumed. Only a half cup of pinto beans contains as many as 20 grams of carbs, so you’re best avoiding beans in order to stay in a state of ketosis. Bananas are high in sugar, which is converted in the body to glucose and then used to fuel each system. One small banana contains roughly 19 grams of carbs, and if you choose a larger banana, the carb count continues to go up. While considered to be an incredibly healthy food, apples aren’t a good option for those who are on a keto diet. Even a small apple has 22 grams of carbs and has absolutely no fat, which is the exact opposite of what someone in ketosis wants to stay in that state. Due to their high sugar content, grapes are a big no-no for the keto diet. A cup of grapes has a whopping 27 grams of carbohydrates, making it even worse than many breads and pastries that someone might consume. Fruit smoothies are delicious, sure, but they’re not a good fit for the keto diet. Because most fruits are incredibly high in sugar, the body uses this glucose as a way to fuel up and you will quickly get out of ketosis when consuming too many fruit smoothies and juices. An average cup of fruit juice can contain as much as 30 grams of carbs, which is often the maximum daily limit for most keto diet participants. Pasta is an often forgotten carb because it’s not thought of in the same way as pastries and baked goods, but it gets broken down by the body into glucose just like any other carb. Couple pasta with the high-sugar content of most spaghetti sauce and you’re in for a carb-laden meal that’s sure to get you out of a state of ketosis. A cup of pasta, which is the suggested serving size, contains 14 grams of carbs. A better option for those on the keto diet would be zucchini pasta made from spiraled zucchini. 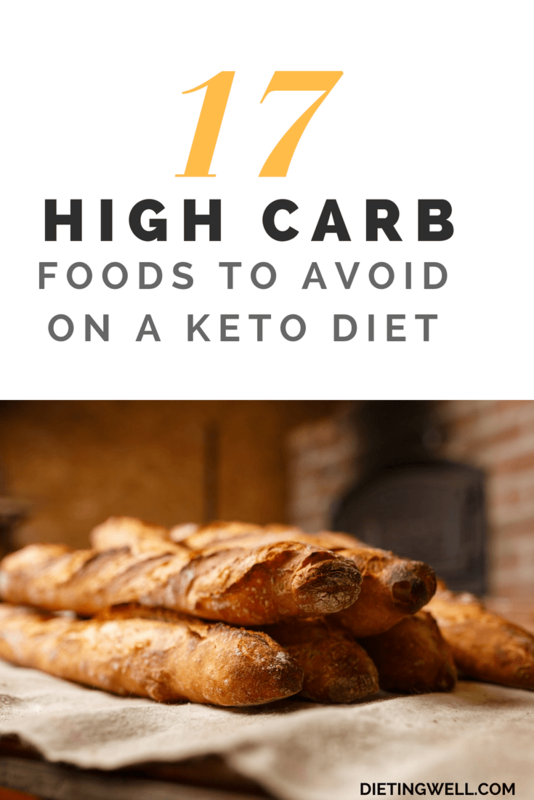 While taking a trip to the local bakery is a tantalizing experience, it’s a nightmare for anyone who is in a state of ketosis. While it’s true that most baked goods are high in fat, they’re also high in carbs and sugars, which will bring your body out of a state of ketosis when consuming them regularly. One example of a bakery item that’s high in carbs is your typical frosted cupcake, which contains 30 grams per serving. Both white and sweet potatoes contain a high level of carbohydrates. White potatoes, in particular, are broken down in the body the same way any other carb would be. While you might assume that sweet potatoes are a better option, they still contain 14 grams per small potato. Low in fat, but incredibly high in carbohydrates, corn is one of the most unfriendly keto foods that you could consume. A half cup of cooked corn contains a whopping 32 grams of carbs, which makes it higher than most other carb-laden foods. This sugary syrup might be delicious drizzled on fruits or added to your beverages, but it’s a bad choice for keto participants. It contains 17 grams of carbs per tablespoon. The amount of carbs in high-frustose corn syrup, or HFCS, is about 14 grams per tablespoon. Unfortunately, many shelf-stable foods are high in HFCS, making them a heavy carb for those in a state of ketosis. Because of the low fat content and high sugar content in most yogurts, they are a problem for those on the keto diet. A small container contains roughly 16 grams of carbohydrates. Whether it’s skim, fat-free, whole or evaporated, milk has roughly 12 grams of carbs per one cup serving. While this might not sound like an awful lot, just think of how much milk the typical person puts on their cereal, in their coffee and in beverages each day. The high-carb content of most alcoholic beverages makes it a problem for individuals following a keto diet. A 12 ounce can of beer contains almost 13 grams of carbs, and wine tops the alcohol charts at 14 grams per glass of sweet dessert variety. A can of soda can contain as many as 36 grams of carbs and even diet sodas, which are toted to be healthier, contain a problematic amount of artificial sweeteners, which can disrupt blood sugar levels and increase cravings for sugary foods. Keep in mind that following a keto diet isn’t for everyone and it does take a period of learning what you can and cannot eat in order to get into and maintain a state of ketosis. Once you are in that state, it will become second nature to choose healthier and higher-fat foods that are naturally lower in carbohydrates. For many dieters, they find that they feel so great on a keto diet that it isn’t worth going back to the old way that they used to eat. The keto diet has been studied extensively and there have been numerous claims made promoting its benefits for those who are dealing with health-related problems and need a better option than medication to feel better. It’s worth trying for yourself to see if it not only helps you to lose weight, but encourages you to feel more energetic and healthier overall.